Like many other websites, the Website may automatically collect certain non-identifiable information regarding Website visitors, such as the Internet Protocol (IP) address of your computer, the IP address of your Internet Service Provider, the date and time you access the Website, the Internet address of the website from which you linked directly to the Website, the operating system you are using, the sections of the Website you visit, the Website pages read and images viewed, and the materials you post to or download from the Website. This non-identifiable information is used for Website and system administration purposes and to improve the Website. Your non-identifiable information may be disclosed to others and permanently archived for future use. The Website uses “cookies”, a technology that installs information on a website visitor’s computer to permit the website to recognize future visits using that computer. The cookies used by the Website do not contain any personal information regarding Website visitors, and do not retrieve any information from visitors’ personal computers (other than IP address and other similar information retrieved or retained in order to facilitate your use of the Website). Cookies are used only to enhance the visitor’s experience on the Website, and to collect anonymous traffic data to enable us to provide a better web experience for the viewing public in general. You may choose to decline cookies if your browser permits, but doing so may affect your use of the Website and your ability to access certain features of the Website. Your Personal Information - During your use of the Website, you may be asked to voluntarily provide certain personal information (such as, should you decide to complete the “Contact Mathnasium” form, your name, email address, postal address, and telephone number). Mathnasium may collect and use your personal information to present the Website, its content and features to you, to contact and correspond with you, to respond to your inquiries and provide you with information that you request from us, to notify you about upcoming events, products and/or services offered or provided by us, our affiliates and/or our franchisees that may be of interest to you, and as otherwise permitted by law. Disclosure of Your Personal Information – Mathnasium may disclose your personal information to a government institution that has asserted its lawful authority to obtain the information or where Mathnasium has reasonable grounds to believe the information could be useful in the investigation of unlawful activity, or to comply with a subpoena or warrant or an order made by a court, person or body with jurisdiction to compel the production of information, or to comply with court rules regarding the production of records and information, or to protect Mathnasium's rights and property or as otherwise required or permitted by law. If Mathnasium is involved in a merger, sale or other reorganization involving all or part of Mathnasium, Mathnasium may disclose your personal information to the purchaser or resulting organization. Accessing Your Personal Information - You may request access to your personal information and information about Mathnasium's collection, use and disclosure of that information by contacting our Privacy Officer at: tracy.cramer@mathnasium.com. Subject to certain exceptions prescribed by law, you will be given reasonable access to your personal information, and will be entitled to challenge the accuracy and completeness of such information and to have it amended as appropriate. 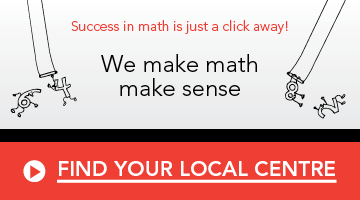 You can help Mathnasium maintain the accuracy of your information by notifying us of any changes to your personal information. Mathnasium does not knowingly collect, solicit or maintain information provided by children under the age of 13. In the event that we learn that we have collected personal information from a child under age 13 without parental consent, we will delete that information as quickly as possible.